March 2012: Tips, eNews and More! If you have children in school you know that March Break is here! March break is a great time to schedule an appointment for your dental cleaning and exam. By planning ahead you can make a day of it with a visit to our office in the morning and an afternoon of adventure with one of the many March Break Activities going on around town. You can request an appointment here. To help you find some fun events in and around the city you can visit these sites: toronto.com and about.com. The theme for 2012 is "Get the real deal on your meal". Proper nutrition is integral to overall health and vitality. The foods you choose literally affects your oral health from the moment you put them in your mouth. Here are some popular nutrition myths that dietitians hear. Reminder: If you are going away over March break and need to reschedule an appointment, please let us know soon. We require two business days notice so that we can offer your scheduled appointment to another patient. from 2:30 pm - 7:00 pm. Click here for more information on teeth whitening options such as take home solutions and Spa Dent in-office whitening. Help us celebrate St. Patrick's Day. We're not just talking about green. Any day that goes by without green veggies – is not a complete day! Your body will thank you once you start to add in some form of GREEN. We're talking about any green veggies that ranges from spinach, to collards, to swiss chard, to zucchini, arugula, cabbage, green beans, broccoli, rapini, dandelion, salad greens and the list goes on. If greens aren't already part of your life in some form, we encourage you to get on the green train and start munching. If it comes down to not knowing how to prepare some of these greens or how to incorporate them into simple recipes, that is where this recipe comes in. 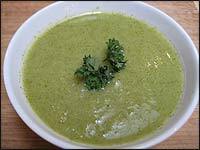 Give this soup a try, it is a really easy way to get in a whole whack of different green veggies in one serving.